Grilling steaks can be done year round, and I can attest that; even if it is 10 degrees outside, I'm grilling and the aroma of steak is so worth it. The recipe for the mushroom spread (seen in picture) is further down the page. The following are both gas grilling steak tips and charcoal grilled steak tips on grilling the perfect steak. Also, gas grilling temperatures and charcoal grilling temperatures are for medium high heat. One of my first tips, (and I have several on this page) begin with your meat choices. What is the best steak for grilling? I love grilling rib-eye steaks, and instead of buying the large 16 oz cut - purchase the 8 oz sized steak. If you find these beauties on sale, buy larger quantities of your favorite high quality meat and load up that freezer to save money. I have found chuck eye steak or skirt and flat iron steaks are available at the meat market or grocery store. They are half the cost of rib eyes and grill up beautifully. You can also fry them up in a cast iron pan. I just make one of my easy steak marinades and let them sit in the refrigerator for a couple hours. If you cannot find this cut of steak, ask the meat department to cut you some. With the several cuts of beef available today, there is a trade-off between the taste of the meat and the tenderness. Following are more tips on grilling the perfect steak. Generally speaking, the more tender the meat - the less flavor it has. Filet Mignon, Porter-house, T-bone and New York Strip steaks come from the loin, and you are charged more money for the tenderness. Flank steak and Top Sirloin can be tender if marinated and sliced properly when serving. When cutting your steak, hold the knife at a 45 degree angle and cut against the grain. The steak will be very tough if you were to cut with it. Tougher cuts such as Tri-tip, Flank Steak, London Broil, Skirt Steak and Beef Ribs come from a very lean part of the steer which is a well used leg muscle. You are better off by making one of my homemade recipes for good steak marinade or investing in a meat tenderizer. It will more than pay for itself in the long run. Avoid overcooking these tougher cuts. They are not as forgiving when served medium-well to well-done, because they don't have a tremendous amount of fat to keep them moist. Grilling time should not be long and the coals will not be as hot as you would grill a strip steak or ribeye. You want to cook it a little bit more gently so you are not pushing out the juice so much. So keep it in the medium to medium-rare stage, and you will be delighted with the results. Kabob Grilling Tips: Sirloin steak works beautifully for grilling kabobs because the meat is an even, dense cut and easy to cube. The flat surface sears much better on the grill. When grilling vegetable with the kebabs, make certain they are not cut too big. When you place the skewer down on the grill the steak must touch the grate. This really is important. 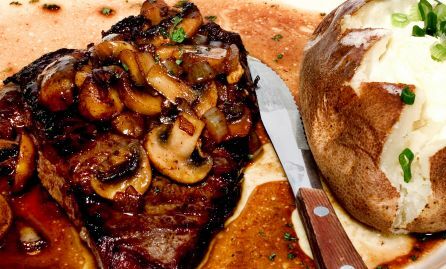 Your steak will not be ruined (you know they sell aged beef), and the flavor is outstanding. I give the steaks a good hour and a half to reach room temperature, and if they are a thicker cut - 2 to 2-1/2 hours. Trust me on this. Grilling time for steak will vary due to how you want it cooked. Below are the lower and higher range temperature your steak should read when done to your liking. USE THIS MARINADE. It is one of my best steak marinades. Place the ingredients in a blender or food processor and blend on high for 30 seconds. Pour marinade over steak and refrigerate OVERNIGHT. Discard marinade the next day and grill the steaks. Perfection at it's finest. Serve with grilled steak and crusty french bread. In a large saucepan, cook bacon over medium-high heat, stirring occasionally until crisp; about 5 minutes. Using a slotted spoon, transfer bacon to a small bowl, leaving drippings in the pan. Add shallots and saute until tender, about 2 minutes. Add vinegar and simmer until reduced by half, about 8 minutes. Remove pan from heat and stir in oil. Add thyme leaves and reserved bacon. Season to taste with salt and pepper. Serve warm over grilled steak, pork or chicken. Makes 1 cup. Recipe adapted from O magazine. Pan frying steak in cast iron. Coat bottom with olive oil and add 2 crushed cloves of garlic. Once it starts turning brown, take it out of the pan and discard. Prep Steak - generously add kosher salt and pepper on both sides of the steak. Top with fresh rosemary. Cover and cure in refrigerator for at least two hours or so. These times are for an one inch thick steak. If you have a two inch thick steak, double the time. Medium-Well, cook for 12-15 minutes per side. See above to check temperature times for desired doneness.